An F-35C Lightning II joint strike fighter carrier variant prepares to launch from the aircraft carrier USS Nimitz in the Pacific Ocean, Nov. 6, 2014. U.S. Navy photo, courtesy of Lockheed Martin by Andy Wolfe (Click photo for screen-resolution image);high-resolution image available. Japan and Australia will be sharing maintenance and upgrade duties for the F-35 Lightning II joint strike fighter based or operating in the Pacific region, the program executive officer for the aircraft announced today. F-35 heavy air frame maintenance, repair, overhaul and upgrade capabilities will be provided by Japan in the northern Pacific and Australia in the southern Pacific, Air Force Lt. Gen. Christopher C. Bogdan told reporters. Both countries are expected to have their facilities operational no later than 2018. Initial heavy engine maintenance capability will be provided by Australia by early 2018, he said, and Japan will provide additional capability 3 to 5 years later. Minister for Defence Senator David Johnston today welcomed the announcement by the US Department of Defense that Australia has been selected to provide support to Joint Strike Fighters (F-35) in the Asia Pacific Region. Senator Johnston said with the JSF Program now maturing, the focus was increasingly turning to sustainment and how the aircraft would be supported around the globe. “The US Department of Defense has determined that Australian industry will provide support to both JSF airframes and engines in the Asia Pacific region,” Senator Johnston said. 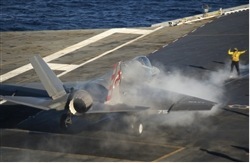 “The JSF is the most advanced and complex fighter aircraft in development or production in the world. Senator Johnston said the maintenance work will likely be based at RAAF Base Amberley and RAAF Base Williamtown. A similar process will take place in Europe, and all of the assignments will be reviewed every three to five years, he added. Over the next two years, assignments for other components, systems and repair capabilities will be determined for both Europe and the Pacific, Bogdan noted. Japan’s final assembly and check-out facility will be quite different from the facilities in Italy and Fort Worth, Texas, the general said. “Both the plant at Fort Worth and the plant in Italy are expansive in terms of distance on the ground,” he said, but Japan is building vertically. Manufacturing will take place on a number of different floors, Bogdan said, and the aircraft will move through the facility on elevators as it is assembled. Efficiencies learned through experience at the Fort Worth facility are being incorporated into the Japanese facility as it is constructed, he said. Just like in Europe, he said, Japan is responsible for the funding and construction of their facility, which will be operated by a Japanese company. Lockheed-Martin will oversee technical aspects of production in Italy and Japan, Bogdan noted, and the U.S. government will oversee security. Geography and operational necessity played a considerable role in the Defense Department’s final decision to place air frame facilities in two locations, the general said. Operationally, it didn’t make sense to introduce a long transportation delay into the MRO&U process, the general said. “If you’re having airplanes in the northern Pacific that need a rapid upgrade to respond to a new threat, having to move them 7,000 miles to do that mod in Australia, or vice versa, has an operational impact, because the war fighter won’t get the airplane as quickly as he needed to,” he explained. Geography wasn’t as serious an initial consideration for engines, Bogdan said. “You can break the engines down into modules, and when you break them down into modules, transportation is much easier, quicker and cheaper,” he said. As more aircraft arrive in the Pacific theater, Australia’s heavy engine maintenance, repair, overhaul and upgrades capability will eventually be supplemented by Japan, the general said. “This is another example of the continuing expansion of global sustainment opportunities for the international F-35 community,” Bogdan said in a release that accompanied today’s announcement.